No movie in filmmaking history has pre-sold as many tickets as have been purchased already for Star Wars Episode VII: The Force Awakens. Millions of people committed to experience a movie about which they know practically nothing: the plot is a mystery, most of the actors are unknowns, and it all takes place a long time ago, in a galaxy far, far away. Such is the power of The Force. In the original Star Wars film, the Force is described as an energy field created by all living things, that surrounds and penetrates living beings and binds the galaxy together. That sounds an awful lot like Happiness, right? It’s all around you. 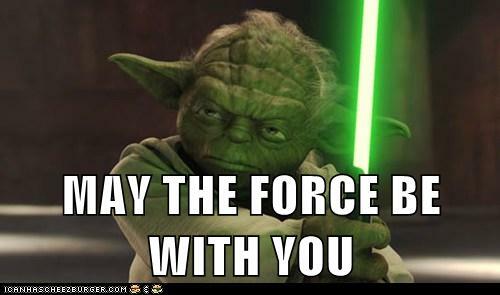 The phrase, “May The Force be with you” is uttered by at least one character in each of the six Star Wars films to date. Happiness, too, is all around you, when you open your heart and mind to notice it. It connects you to others. The Force, as first mentioned by Jedi Master Obi-Wan Kenobi, “surrounds us and penetrates us. It binds the galaxy together.” Happiness and the family of positive emotions help you to build and nurture relationships with others, and relationships are one of the five pillars of Well-Being, essential to your ability to thrive in the world. It gives you strength. Yoda teaches that, “a Jedi’s strength flows from The Force.” The trio of Gratitude (past happiness), Happiness (in the Now), and Optimism (expectation of future happiness) give you strength to endure even in the face of adversity, and help you bounce back more quickly from setbacks. You must practice it to tap its energy. Those who nurture awareness, whether of The Force or Happiness, find that it becomes easier to access the power that flows from it. Practice makes you stronger. Spend time every day focusing on what is good and right in your world, and you’ll find it is easier to find your joy in stressful times. Beware the Dark Side. The Force has a “dark side” which feeds off emotions such as anger, jealousy, fear, lust, and hate. While each of these emotions can serve you in the some situations and small doses, when you live often in them they can destroy you, and destroy those around you (or at least your relationships with them). It is at the core of your being. Just as The Force is in all of us, so are Happiness, kindness, compassion, and love, which are your true nature. At the end of Episode VI, Darth Vader dies. But first, he emerges from the Dark Side, responding to (his son) Luke Skywalker’s belief that beneath the evil was still some good. It can enhance your natural, physical, and mental abilities. Channeling the Force, characters demonstrate powers such as telekinesis, telepathy, mind control, and enhanced speed. Happiness, meanwhile, is proven to increase personal productivity by up to 20%, expand creative thinking, speed decision-making, and improve personal and community health. Pretty powerful stuff! Choose to leverage your natural gifts. Force-sensitivity is a condition where a life form possesses a natural connection to The Force; yet it requires awareness and training to truly harness the power of the Force.Happiness researcher Sonja Lyubormirsky, author of The How of Happiness, has shown that Happiness and Positivity flow from three sources: life circumstances account for 10% of our happiness, life choices 40%, and genetics 50% — so some people are just “born happier.”Yet whatever your natural predisposition, when you actively “train” your positive emotions, e.g. thru daily gratitude exercises, mindfulness, etc., you can leverage your natural gifts to harness the power of Happiness. Mindfulness is a gateway to access your power. In numerous scenes across the six films, agitated characters took a moment to focus when calling on The Force. Luke closed his eyes to center himself, Yoda visibly relaxed into mindfulness before engaging in battle, and even Darth Vader got quiet when accessing his precognition. Each had to be fully present to engage.Happiness, like The Force, exists only in the Now. So to truly experience Happiness, Joy, Calm, Contentment, or any of the positive emotions, it helps to pause, take a deep breath, and become present to yourself and those around you. With or without a light saber and a mentor like Yoda to guide you, you have the power to change your world. Strengthen your access to The Force (aka Happiness) first by nurturing your awareness of it in the world – sometimes that is as simple as looking for what is right and good today. Practice Mindfulness to be able to focus your attention in the Now – even one-minute each day of conscious breathing and relaxation will build your capacity to handle stress and access Happiness. Finally, remember that Happiness, like The Force, is what binds all living beings together. So when you connect with others, you help Happiness be stronger in all of you.